OK, as I’ve admitted here before, I like iPad stands. Like them a lot, possibly a tad more than you should. I have three favorite iPad stands already – and seeing this one reviewed by my friend Larry Greenberg’s RunaroundTech site makes me feel like I could soon have four. It’s four pounds of steel. 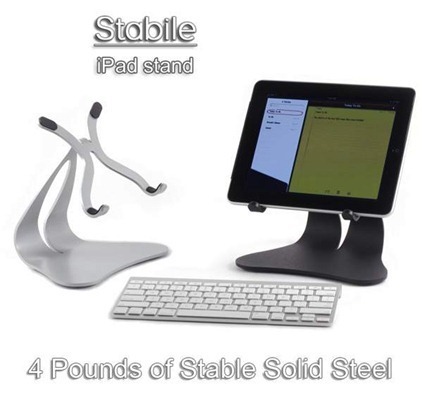 Stable, solid steel too apparently – and that’s my favorite kind when it comes to iPad stands. Solid American steel, nearly 4 lbs. So … until late last year I was blissfully unaware of how exciting a microfiber cleaning cloth can be. I thought they were all much of a muchness – as in, not a whole bunch of difference between one and another. Then I got a chance to try out Mobile Cloth, and I discovered that it’s far easier to use and far more effective than any others, and I was excited about a screen cleaning cloth. Ever since then, Mobile Cloth has been one of my least glamorous but most favorite iPad accessories. Now I’ve got a new favorite – Mobile Cloth’s cool new little brother, the MC Nano, which I’ve been trying out this week leading up to its public release. It’s right around 1/4 the size of the original Mobile Cloth, but is still just as effective. It still gets the iPad screen clean with just a few quick wipes and with minimal effort – and the Nano is small enough to be a much more portable solution. This is one you can easily tuck into an iPad case pocket or your own pocket to have it around for on-the-go screen touchups.